January 2000 — People are not uniformly distributed on our planet. They tend to hug the coastline. An estimated 50 percent of humanity lives within 100 miles of a coastline, and this figure is growing. Here on Cape Cod, we are all keenly aware that the coast is a unique environment that is routinely affected by wave- and storm-driven events. Like most people along the eastern coast of the United States, we know these events often have adverse impacts. We’ve witnessed beaches eroding more than 10 feet per year. In 1991, even a relatively weak tropical cyclone like Hurricane Bob caused severe damage to New England and North Carolina. Worldwide, tropical cyclones constitute one of the most important weather forecasting problems. In developing nations, tropical cyclones are the leading cause of death from natural phenomena. A single event took more than 100,000 lives as recently as 1991 in Bangladesh. A year later in the US, Hurricane Andrew killed more than 60 people and caused nearly $30 billion in damage. Hurricanes, storms, beach erosion, and other natural processes can only exact greater tolls as we turn more of our coastlines into residential and business properties. In addition, a combination of biological, chemical, and physical processes can result in the outbreak of red tides or the dispersal of oil spills or other pollutants along our coastlines. Such events, caused by nature and/or by humans, damage property and natural habitats and harm fisheries, tourism, and the local economies. Woods Hole scientists and their colleagues have been actively involved in coastal research for many decades. WHOI researcher Alfred Woodcock, for example, discovered in 1948 that red tide outbreaks increased respiratory illnesses in coastal residents because they inhaled contaminated airborne sea spray generated by breaking waves. More recently, WHOI scientists have conducted coastal research at the US Army Corps of Engineers’ Field Research Facility (FRF) in Duck, North Carolina, (see page 24) and have helped conceive and build the Long-Term Ecosystem Observatory (LEO-15) off the coast of New Jersey. Interestingly enough, however, WHOI scientists haven’t taken full advantage of the coast in their own back yard—primarily for the same reason that they have exploited it as a port for ocean-going research vessels. Martha’s Vineyard and the Elizabeth Islands protect Woods Hole and make it a safe harbor, but they also block scientists from immediate access to undisturbed ocean waves and alongshore currents. In contrast, the southward shoreline of Martha’s Vineyard faces the open ocean.Thus, it offers an ideal and still relatively accessible site for studying coastal processes. In fact, its southfacing beachfront is particularly valuable to scientists because prevailing winds blow directly onshore and in line with the direction of the ocean’s waves. With funding from the National Science Foundation, WHOI scientists and engineers have designed a nearshore observatory in the Katama section of Edgartown on Martha’s Vineyard. Construction of this observatory began in December 1999 and is scheduled to be completed in time to monitor the fall 2000 hurricane season. The Martha’s Vineyard Observatory will have sensors mounted on two seafloor nodes, at depths of about 5 and 15 meters, respectively, connected to a shore station via a buried cable. Instruments mounted on the nodes will continually monitor mean sea and wave heights, current strengths, seawater turbulence, subsurface sediment movement, sunlight intensity, and the temperature, salinity, and carbon dioxide levels of the ocean’s waters. Onshore, a mast extending about 8 meters above the beach’s dunes will house meteorological instruments that will sample the near-coast air transported to land by the southerly winds. 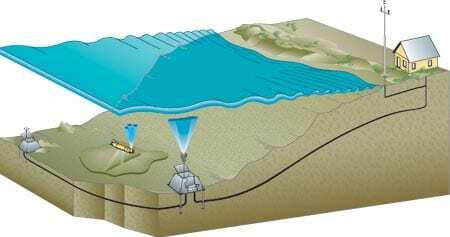 The onshore instruments will continuously measure wind speed and direction, atmospheric carbon dioxide levels, temperature, humidity, and the concentration of sea salt, water vapor, and small organic or inorganic particles (collectively called aerosols) that are ejected out of the sea and into the air. 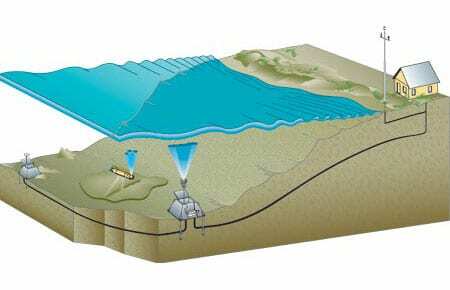 Measurements made in the atmosphere and the ocean will be jointly collected via underground cables at a shore station in the Katama Air Park, and made available in near real time on the Internet. 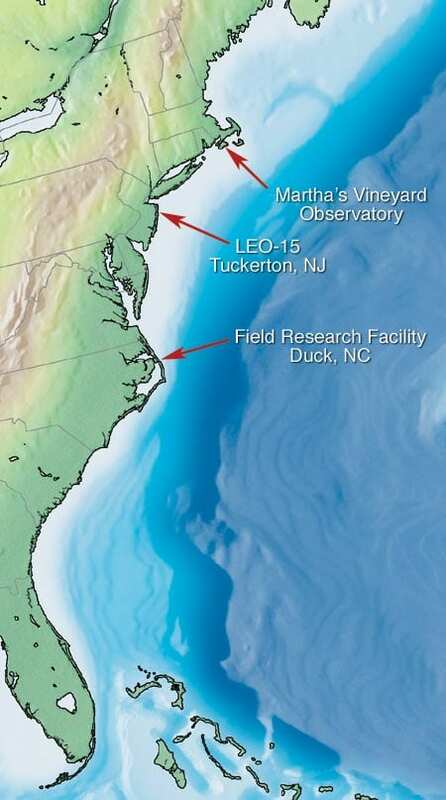 Information collected at the Martha’s Vineyard Observatory will be combined with data collected at the LEO-15 site off New Jersey and at the FRF in North Carolina. Together, these three facilities will provide a unique network along the East Coast for studying coastal processes. Like FRF and LEO-15, the Martha’s Vineyard Observatory will provide scientists with a well-characterized natural laboratory that will enable them to study how winds, waves, currents, seafloor topography and sediment structure, and other factors combine to affect the coastline. In addition, it will enable them to learn about the processes and conditions that affect coastal marine life. However, one of our main objectives for the Martha’s Vineyard Observatory is to gain a better understanding of coastal weather phenomena. Meteorologists are only now beginning to identify and investigate physical processes that are unique to the coastal environment. The same, evershifting wind and wave patterns that combine to create such turbulent, dynamic systems at the shoreline and beneath the sea surface, also generate a great deal of action in the air above the sea surface. Winds and waves constantly disrupt the boundary between air and sea, promoting exchanges of gases, particles, heat, and momentum between the ocean and atmosphere. One of the many outcomes of this lively border exchange is the production of sea spray. Measurements of aerosol concentrations at the Martha’s Vineyard Observatory will enable us to learn how sea spray is produced and transported. This, in turn, will help improve our ability to predict marine haze and fog in coastal regions. In addition, we will be able to study how the evaporation of sea spray into the atmosphere affects the transfer of heat and moisture near the ocean surface. We can also use the observatory to explore how solar energy radiating into the sea surface affects the system. Warmer surface waters, just like warmer air, are more buoyant; thus, warmer waters rise, pushing up air masses above the sea surface, and initiating another series of dynamic processes in the atmosphere. At the Martha’s Vineyard Observatory, we can focus on observing, at a small scale, a range of complex air-sea interactions such as those noted above, which may also take place on a larger scale in the vaster ocean. One high-priority research topic is the study of air-sea exchange of carbon dioxide, a heat-trapping, industrial greenhouse gas that has been accumulating in the earth’s atmosphere for the past several decades. Such studies will help us estimate how the oceans absorb and retain this gas, and thus allow us to assess the extent to which the oceans can store excess carbon dioxide, thereby reducing the threat of global climate change. Many of the studies we propose at the observatory require the expertise of scientists in several disciplines. Carbon dioxide is not the only trace gas with potentially important biogeochemical consequences. In one scenario, for example, increased sunlight might spark a bloom of phytoplankton that produces an abundance of a gas called dimethylsulfide. Wind and wave action transport dimethylsulfide into the air, where it may create aerosol particles that reflect or block sunlight, possibly cooling the earth’s surface and eventually leading to fewer phytoplankton. Another area of research that we propose to initiate at the observatory is a study of the interaction between ocean waves and winds during a hurricane event. For example, we could use measurements made at the observatory to prove (or disprove) the theory that winds and waves from hurricanes agitate the ocean like a washing machine, generating foam on the sea surface that acts as a lubricant —thus reducing the drag on the hurricane from the sea surface and possibly keeping it from dissipating faster. Martha’s Vineyard’s exposure to the open ocean and frequent storms, while hardly a blessing to the island’s inhabitants, will provide us with an invaluable means to study the effects of severe storms and possibly hurricanes. The permanent equipment deployed at the facility will include a set of rugged instrumentation able to withstand extremely high wind speeds and rain, allowing measurements that have rarely been collected before, and providing us with the real-time data necessary to improve the computer simulation models that currently predict hurricane events. As we quickly move toward computer models that couple ocean and atmosphere processes to generate better weather forecasts, we require continuous, long-term, high-resolution measurements of phenomena in the air and water to test and improve these models. Observations from our nascent network of East Coast nearshore observatories and moored ocean buoy observatories represent a first step toward supplying the comprehensive, highquality data needed to make these coupled models effective. Ultimately, we expect that the improved understanding of coastal processes afforded by the Martha’s Vineyard Observatory will be combined within this observational network to improve our abilities to forecast waves, ocean circulation, and weather. Collaborators on the development of the Martha’s Vineyard Observatory include scientists John Trowbridge and Cheryl Ann Butman and engineers Robert Petitt and Jonathan Ware of WHOI’s Applied Ocean Physics and Engineering Department (AOPE), and Marga McElroy, Mike Purcell, Roger Stokey, Ben Allen, Ned Forrester, and Robert Goldsborough of the AOPE Ocean Systems Laboratory led by Christopher von Alt. WHOI's new nearshore observatory on Martha's Vineyard, scheduled to be completed by the fall of 2000, will have land-based and sea-based sensors to continuously monitor oceanic and atmospheric conditions. The observations will be combined via underground and submarine cables at a shore station and available instantaneously on the Internet. Illustration by Jayne Doucette. The combination of the new Martha's Vineyard Observatory, Rutgers University's Longterm Ecosystem Observatory (LEO-15), and the US Army Corps of Engineers' Field Research Facility will provide a valuable network of research installations along the East Coast to study coastal processes. 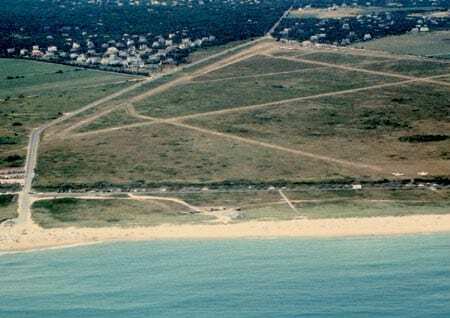 The Martha's Vineyard Observatory?s south-facing beachfront is particularly valuable to scientists because prevailing winds blow directly onshore and in line with the direction of waves. Illustration by Jayne Doucette.